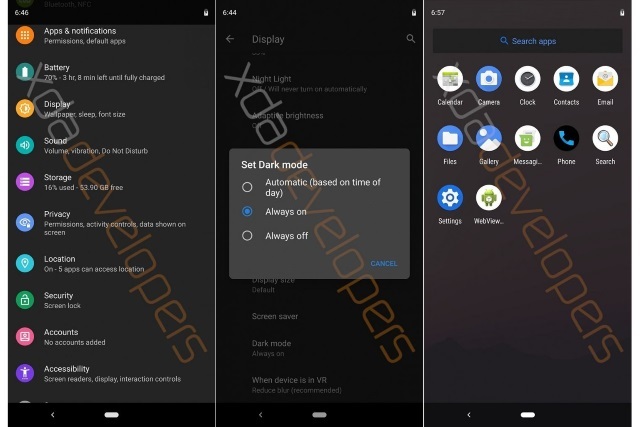 The inclusion of a system-wide dark mode in Android Q is something that has been rumored for a little while now, and a new leak of the next version of Google's mobile operating system seems to confirm this. A leaked build of Android Q not only features a customizable dark mode option, but it also shows that Google has tightened up permissions to help improve privacy. There are also exciting references to a Desktop Mode feature which would appear to be similar to Samsung DeX in making it possible to connect a phone to a monitor and use it like a desktop computer. News of the Android Q leak comes courtesy of XDA Developers who managed to get its hands on a build running on a Google Pixel 3 XL, and it would appear to give a good glimpse into the future. The inclusion of a "Set Dark mode" option in Display settings will please many people and it need not be as simple as being enabled or disabled. Dark mode can also be configured to switch on and off at different times of day, much like Night Mode can on many handsets at the moment. Desktop Mode is not something we have heard about before, and this is certainly intriguing. Unfortunately the leaked build of Android Q that was available for testing only featured references to this new feature, and it was not working. This means that we can only guess at just how it will function, but it would certainly seem likely to be a Samsung DeX clone. Android Q sees Google taking steps to improve privacy, specifically through changes to permissions. You can not only easily see which apps have what permissions, but also implement restrictions as and when you see fit. The screen lock setting has two new options: "SmartLock only extends unlock" and "Lock screen when trust is lost." The former lets a trusted device keep your smartphone awake for longer, but doesn't allow it to unlock the device once it has been locked. The latter option will lock the smartphone when the last trusted device is no longer trusted. The app installation dialog is no longer full-screen. Instead, it's a pop-up like on tablets.